I receive message "Corrupted accessory file. Please try another file." I've tried with simple 6-face cube without texture. The same result. Internal Iclone accessories invokes same error, when drag&drop. 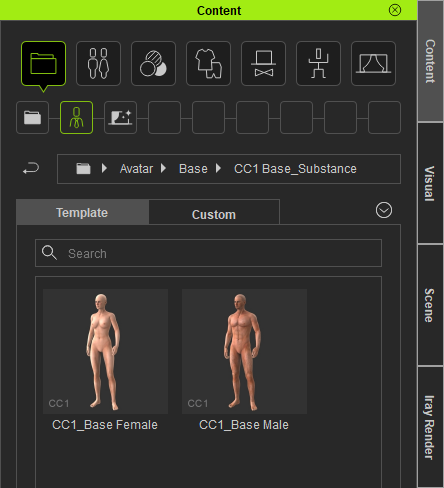 Unfortunately CrazyTalk 8 is only compatible with avatars and accessories from iClone 6 and Character Creator 1/2. Content from iClone 7 or Character Creator 3 is not compatible with Crazytalk 8. Note: If you also have iClone 6 and Character Creator 2, you can install these alongside your iClone 7 and Character Creator 3 without any issues. I'm sorry I can't bring you better news on this issue. And which version will be handle button "Send head to Character Creator"? CC2 or CC3? I need same accessories on both models (my glasses, modelled in Blender). Unfortunately 3DXChange 7 cannot export my Blender model (glasses) to "Iclone 6" version. I have only "Iclone 7" option in "Target version" dropdown. Should i try 3DXChange 6 to export Blender fbx to iClone 6? The "Send Head to Character Creator" option only works with older versions of Character Creator. It won't work with Character Creator 3. However you can choose the "Export RLHead" option instead to use the head in Character Creator 3. This can then be applied to one of the CC1 Base characters found in the folder below (you can then convert to a CC3 Base character if you wish). Generally if you plan on sending avatars or accessories to CrazyTalk 8, then you will need to use iClone 6 and 3DXchange 6 to avoid running into problems. In this case, HOW import custom accessories into Crazytalk 8 without iclone? I have options "import Accessories", when i press it, opens filedialog with available extension "*.iAcc". 3dXchange does not allow export to "*.iAcc". How i can make custom "*.iAcc" file? 1. Open your Hat model in 3DXchange 6 and export as a Prop. 2. In iClone 6 load a character and correctly position and resize the Hat prop onto the characters head. 3. Now right click the Hat Prop and select Attach > Attach and then choose the character head as the parent. 4. Now Save the Hat as an Accessory in Content Manager. 5. Finally you can now drag this saved Hat.iAcc onto your Crazytalk 8 head and it will be applied as a CT8 accessory.